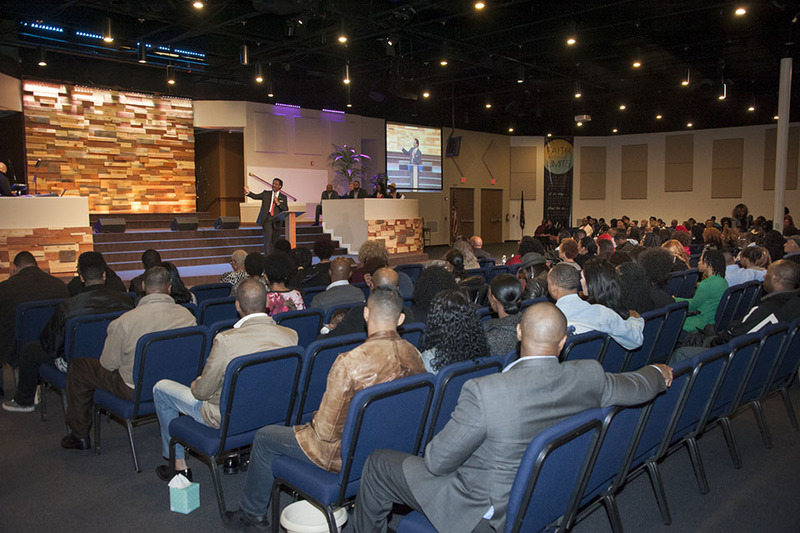 Vice President for Student Affairs and Dean of Students William Watkins spoke at Living Praise Worship Center in Chatsworth on Super Sunday. Photo by Luis Garcia. Dean of Health and Human Development Farrell Webb shared about his academic journey and how college is accessible during his Super Sunday address at H.O.P.E. 's House Christian Ministries in Granada Hills. Photo by Luis Garcia. Watkins' message focused on how a college education is obtainable and possible. Photo by Luis Garcia. During a reception before speaking at H.O.P.E. 's House, Webb met with church leaders and members of the congregation. Photo by Luis Garcia. Leaders from California State University, Northridge joined their colleagues from CSU campuses around the Golden State to promote the merits of a college education, during Super Sunday church services on Feb. 26. Super Sunday is one of the culminating events for Black History Month. 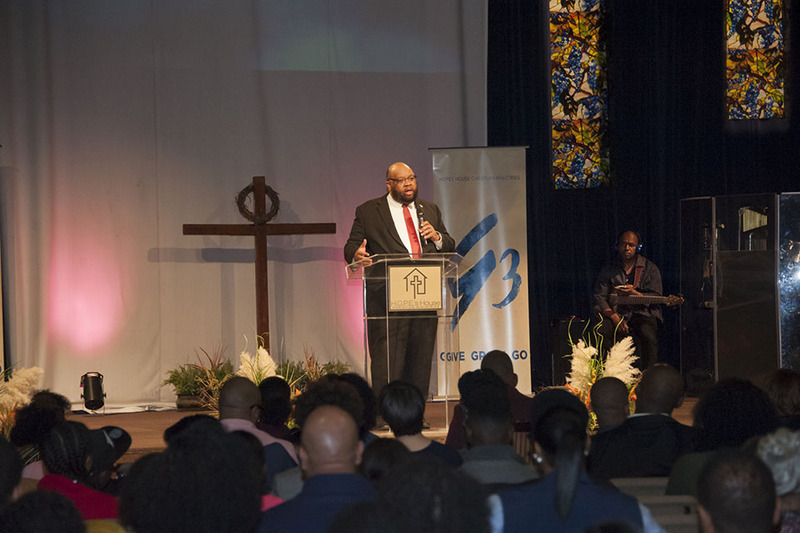 Since 2005, the CSU has partnered with California churches serving predominantly African-American congregations, to connect with black families, potential future college students and parents. 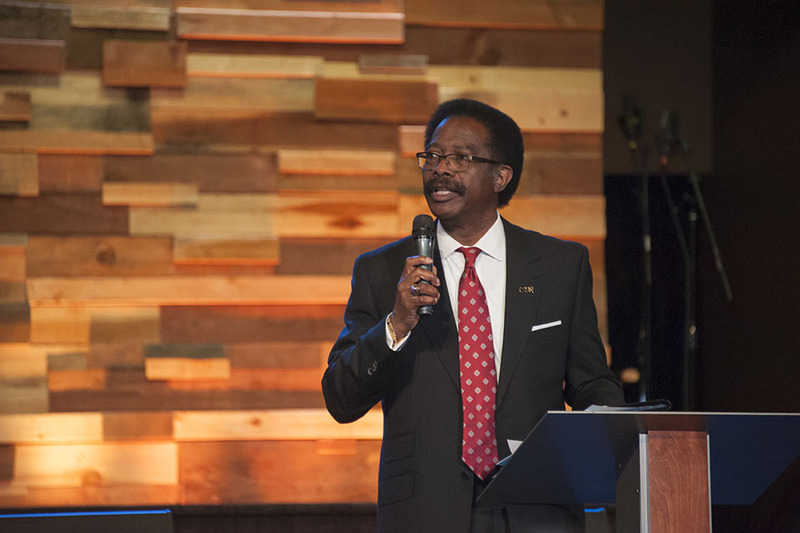 CSUN Vice President for Student Affairs and Dean of Students William Watkins spoke at Living Praise Worship Center in Chatsworth. Farrell Webb, dean of CSUN’s College of Health and Human Development, also spoke at services at H.O.P.E.’s House Christian Ministries in Granada Hills. On Feb. 12, Deb Wallace, CSUN associate vice president of financial services, spoke at Bethel African Methodist Episcopal (AME) church in Oxnard. The overarching goal for each speaker and the initiative as a whole is to encourage college preparation, enrollment and increase graduation rates of African-American students. 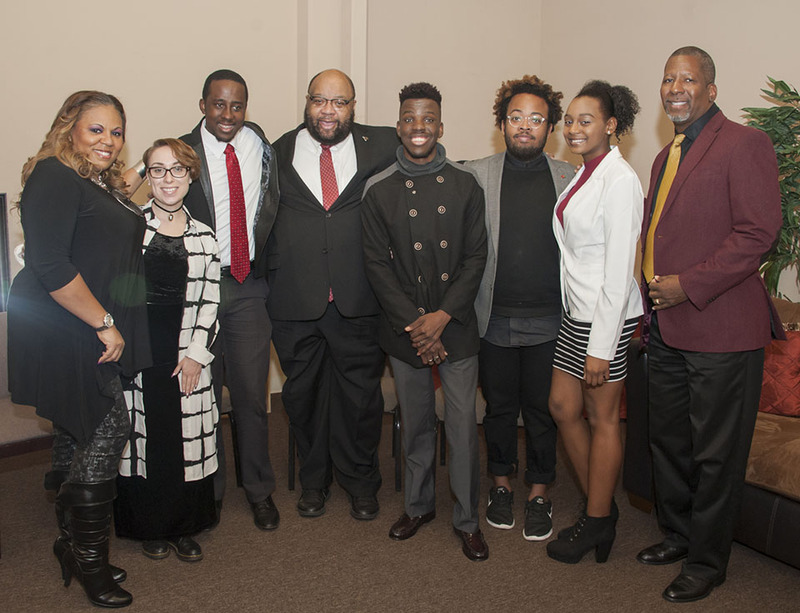 The churches opened their doors to the speakers to share messages about the importance of a college degree, for high school-age young people thinking about the next step, of which there were many in attendance. Though he is in his first year at CSUN — he had spent the previous two years at California State University, Los Angeles, and 19 years before that at Kansas State University — Webb jumped at the chance to connect with the local community through the inviting and lively congregation at H.O.P.E.’s House. Watkins emphasized that it takes more than just the individual student’s will and drive to attain college success. When a young person reaches graduation, there are many people who have contributed to that accomplishment, he said. For more information about CSUN’s student outreach programs or annual Super Sunday events, visit the campus’ Office of Student Outreach and Recruitment Services (SOARS).